So, I was thrilled to discover Sara's post about child management. It is full of really practical ideas for communicating your expectations that she learned through her training and experience in education. Those of you who are former teachers or are school librarians probably already know those, but for those of us who come from other backgrounds, I think it is tremendously helpful to read this whole post. And I am so grateful my library doesn't have a toy boat! Thanks Marge for linking to your very wise coworker's blog. I'm glad to have another to add to my Reader! 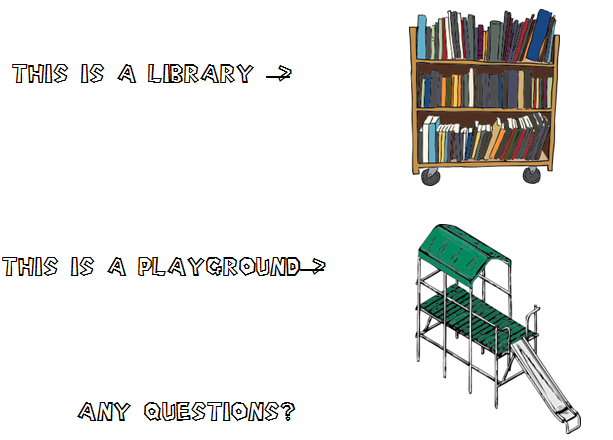 Children rarely cause problems in our library, but it's a different story with the tweens. I found myself frequently saying, "This is a library, not a lunch room!" I try to keep my requests positive, and it helps that my manager is okay with being the Bad Cop. I'll tell the kids that I think they're only a little loud, but if they continue, my boss will get angry and ask them to leave. Usually it works, and since we've implemented "Good Cop, Bad Cop" we have had fewer problems. Oh, I should have been more specific! I was really thinking more of tweens than kids, 6th-8th graders mainly. This isn't a day care center. It's the response to the kids that argue I can't kick them out for acting like wild animals because "my mom is picking me up here in three hours". One of my rules is "use a one foot voice" meaning to talk softly as to only be heard by people within one foot of yourself. I hardly ever use it, but others use it frequently!